I’ve never met a french fry I didn’t like. Even the cold, soggy ones. As much as I love them, I try to avoid them, being that they aren’t the healthiest, low fat, low calorie thing on the menu. These carrot “fries” aren’t made of potatoes, they aren’t fried, and they aren’t likely to fool anyone. They are however, healthy, and even more importantly DELICIOUS! Peel carrots and cut them into thick strips. Toss them in a little olive oil, sprinkle them with some sea salt, and place them on a parchment lined cookie sheet. 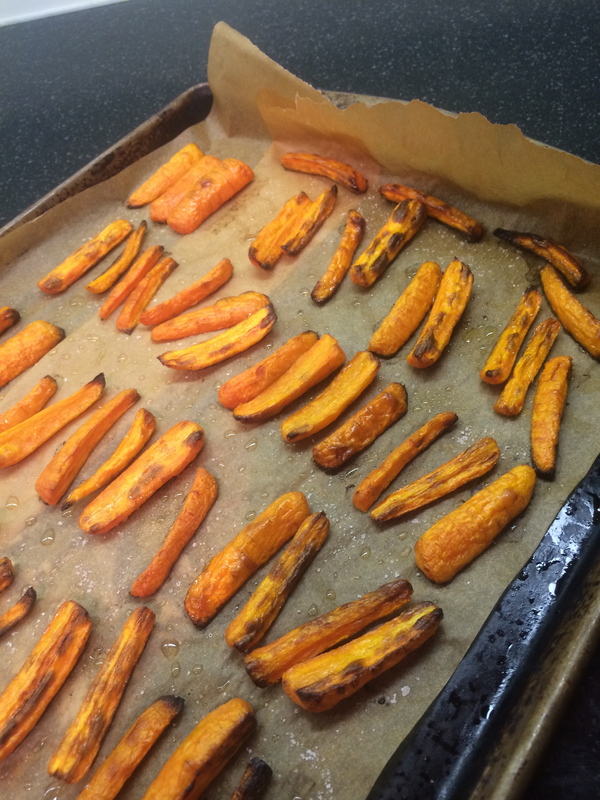 Bake in a 425 degree oven for about 17-20 minutes ( depending on the size of the carrot strips) until they are brown and crisp on the outside, and starting to soften slightly. Check out our quick tip for peeling carrots! This entry was posted on October 15, 2014 at 6:56 am and is filed under Food. You can follow any responses to this entry through the RSS 2.0 feed. You can leave a response, or trackback from your own site.